Heart\'s leading man in My Korean Jagiya is a K-pop star! Who is Heart Evangelista's Korean leading man in My Korean Jagiya? Former U-Kiss member Alexander Lee is the leading man of Heart Evangelista in GMA-7's upcoming romantic-comedy series My Korean Jagiya. Heart Evangelista's "Korean Jagiya" is finally revealed! 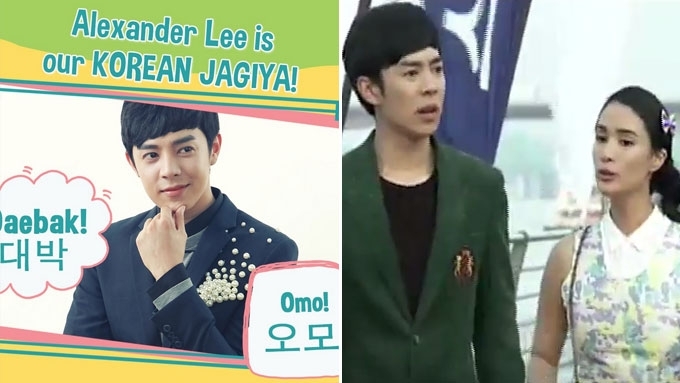 Former U-Kiss member Alexander Lee is cast as the leading man of Heart in the upcoming GMA-7 romantic-drama series My Korean Jagiya. Jagiya, as explained during the story conference of the show, means "darling" in Korea. This was announced during the 24 Oras episode aired earlier today, July 25. The singer-actor from Korea arrived in the Philippines last Sunday, July 23. Alexander, who is called Xander by his fans, revealed that he is nervous and excited to work with Filipinos. He said, "I didn't know about how Filipino drama is gonna be and that Heart is gonna be in it. "I never thought I'm gonna go back to drama." According to him, his role in this original Kapuso series is challenging, since his character will be a mixture of the past roles he did in Korea. "Usually my image is either very bright or very dark. But now this has like a mixture. "It's a little difficult for me but I'm very happy because everyone around me is helping." What does Heart think about her "Korean Jagiya?" "So easy to work with, as time goes by we're more comfortable with each other." Just before the airing of 24 Oras, Xander posted on Twitter, "Turn into #GMA and watch #24ORAS NOW for detail about my newest project in Philippines. #MyKoreanJagiyaTheReveal"
Meanwhile, Heart also welcomed her new leading man on Twitter. She wrote, "Welcome to the Philippines Xander Lee!!!! #MyKoreanJagiyaTheReveal #MyKoreanJagiya"
Aside from Xander, Heart's co-stars in My Korean Jagiya are Edgar Allan Guzman and Jinri Park. No airing date has been announced yet for this new Kapuso series to be directed by Encantadia director Mark Reyes.